Tomorrow, the Iowa Environmental Council will join 35 environmental organizations and individual advocates from across Iowa at Environmental Lobby Day/REAP Day at the Capitol, an annual event held in the state Capitol building. The event will be held 9 a.m. to 1 p.m. in the rotunda, and is open to anyone that cares about protecting Iowa’s natural resources. The event, co-hosted by the Council and Iowa Resource Enhancement and Protection (REAP) Alliance, is a fantastic way for concerned citizens, activists, and members of environmental and conservation-focused organizations to meet with and speak with Iowa legislators about environmental programs and policies face-to-face. Last year, nearly 150 people and more than 30 organizations gathered at the statehouse to speak with their elected officials about “closing the deal for conservation.” This year, activists and organizations are going to use that momentum to create meaningful change in environmental policy in Iowa, calling upon legislators to support our natural resources through sustained funding. Funding for conservation and water quality initiatives are incredibly important to statewide and local conservation efforts. We must invest in REAP and the Water Quality Initiative to increase their reach and impact, and fill Iowa’s Natural Resources and Outdoor Recreation Trust Fund. Nitrogen and phosphorus pollution in Iowa waterways and the corresponding health risks will also be a focal point for many. Many organizations, including the Council, will call for improvements to strengthen Iowa’s Nutrient Reduction Strategy to achieve measurable progress in achieving clean water. The strategy currently lacks a timeline, local goals, reliable and consistent water quality testing and assessment requirements, and long-term sustainable funding. Face-to-face discussions are one of the best ways to show legislators that environmental legislation is important to their constituents. This year, help us show policymakers that Iowans care about conservation. Council Executive Director Ralph Rosenberg, center, addresses the assembled crowd at Environmental Lobby Day, March 18. About 150 conservation advocates representing over 35 organizations gathered at the statehouse Tuesday to call on lawmakers to do more to protect clean water and a healthy environment—and provide funding needed to get it done. 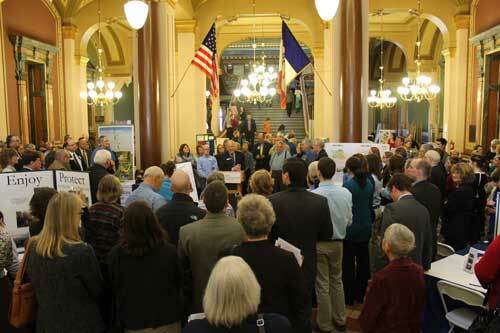 The morning rally was co-sponsored by the Iowa REAP Alliance and the Iowa Environmental Council. Conservation progress in Iowa could receive a big boost this year if legislators heed the call of Iowa’s conservation community to provide Iowa’s Resource Enhancement and Protection program, or REAP, a special $25 million appropriation in celebration of its 25th anniversary. But with many Iowa lakes plagued by harmful algal blooms, and record levels of nitrate pollution last year a threat to safe drinking water for half a million Iowans, advocates also cautioned legislators that stiff oversight, goals, and measurement of progress are needed to protect Iowa’s water resources. This is one of a series of posts we will offer ahead of Environmental Lobby Day March 18. A complete schedule and details about the event are available at the Council’s website. Tuesdays at the State Capitol are always exciting. The place is packed with legislators, staff, lobbyists, media, school groups, and other fellow Iowans all rushing about. With all this going on, how can we be sure our message about protecting clean water and a healthy environment will be heard? We can be prepared in advance. Look up your legislators and write them a note to let them know you’ll be coming on March 18. Let them know conservation organizations will have displays in the rotunda and ask what time they might stop by. Say you’re planning to come to the statehouse and are interested in meeting them personally. Be sure to thank them for their service and their time, no matter what. Practice your “sales pitch” in advance. We will provide you some policy talking points to consider, but it is also important to tell your own story about why a healthy environment matters to you. Do you want clean water for your kids? Are you worried about habitat loss for wildlife? Legislators and staff are busy and may not have much time to talk. Practicing in advance can help you feel more comfortable at the statehouse. Bring a friend. It makes the whole day more fun. They can register too at envirolobbyday.eventbrite.com. We offer a pre-event training at the statehouse (8:30 am, room G15.4 in the statehouse) before the event. (YES, the meeting room has changed since we first announced it.) That’s your time to get questions answered and feel confident about the day. 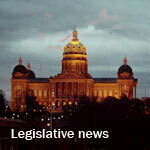 In the legislature, March is the month when crucial budget negotiations take place. By turning out in person, we are helping “close the deal for conservation” at the statehouse this year! We have the opportunity to see Iowa’s Resource Enhancement and Protection Program funded at $25 million in its 25th year, and that’s just one of several important conservation programs that need our support. Legislative funding and oversight–including pollution reduction goals and timelines–are essential to getting Iowa’s water pollution problems under control. If we do not show up and tell our elected officials we expect progress for clean water and a healthy environment, momentum for our issues could evaporate quickly in closed door budget negotiations. We can’t let that happen. The Iowa REAP alliance has new resources to help you share your support for conservation with your friends. This week, take a moment to be sure you’ve invited friends to come with you to Lobby Day. (By the way, have you told us if you are coming?) Navigating the capitol and speaking to legislators is easier with friends at your side. Check out these suggested social media posts to let your friends know you care about REAP and conservation in Iowa. Set a goal of bringing a full car load of friends with you to Des Moines. Ask yourself who should sign up and come. Your coworker? Your hunting buddies? Your best friend from Jazzercise? Let those folks know this is important, and they ought to come with you. Everybody can “commit to attend” at http://envirolobbyday.eventbrite.com! Participants gather in the statehouse rotunda for a press conference. Representatives from nearly 30 organizations and over 100 individual Iowans from around the state braved blustery conditions and surprise snowfall Tuesday to assemble at the statehouse to voice support of clean water and a healthy environment. At the event, sponsored by the Iowa Environmental Council, Iowa REAP Alliance, and Iowa’s Water and Land Legacy Coalition, together with numerous other groups, advocates issued a clear message: natural resource funding is critical for Iowa’s future. In a press conference, Ed Raber, director of the Washington Economic Development Group (WEDG), praised Iowa’s Resource Enhancement and Protection program which makes grants for local projects like watershed protection and development of recreational trails all over Iowa. State Senator Bob Dvorsky, addressing those assembled, said “we have the resources” to fully fund REAP with the $20 million the program was created to receive. He called on Iowans to educate their representatives about the benefits the program provides all over the state. Funding the Natural Resource and Outdoor Recreation Trust Fund. A super-majority of Iowans created this constitutionally protected fund in 2010, and legislation introduced this year would finance the fund with a 3/8 cent sales tax increase, providing an estimated $120 million each year for conservation action. Continuing funding for lake and river restoration, as well as REAP. The Governor’s proposed budget significantly reduces funding for programs that enhance public enjoyment of Iowa’s lakes and rivers, and continues to provide the Resource Enhancement and Protection Program funds far short of the $20 million the program was designed to receive. More investment in these programs is needed. Supporting effective agricultural conservation. State government’s strategy for reducing nitrogen and phosphorous pollution in Iowa’s waterways lacks clear goals and accountability. The legislature could provide both in addition to funding the Watershed Improvement Review Board which provides critical support for local watershed efforts. Provide the resources necessary to enforce existing laws. A pending agreement between the Environmental Protection Agency (EPA) and DNR will result in a major inspection effort to ensure nearly 8,000 Iowa livestock facilities do not discharge manure into local waters. DNR needs additional staff to complete this work without weakening its efforts in other areas.